Placemaking Week Preparation Kicks Off in Amsterdam: Make Sure to Register for the Early Bird Rate! 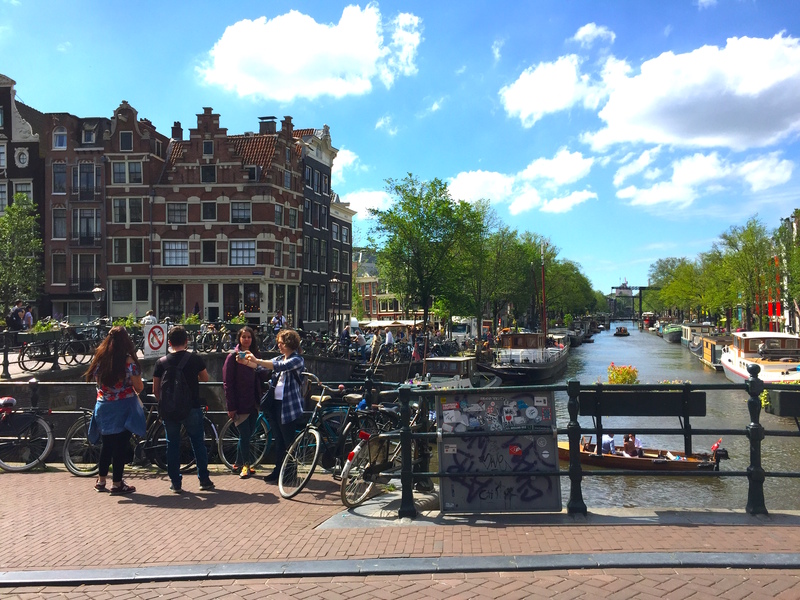 PPS recently visited Amsterdam in preparation for Placemaking Week, where an action-packed few days of conference planning, presentations, site visits, and meet-ups with local placemakers was thoroughly enjoyed by all. Things are looking good, and now that the detailed program is almost ready to go after such an incredible response to our Call for Proposals, we are well on our way to ensuring this is a groundbreaking event for the global placemaking movement! We know Amsterdam is far more than just a pretty picture (although it is definitely this too - we couldn't get enough snaps of the place), but it became even more clear why we chose this ideal host city to showcase placemaking for Europe. The city truly embodies the four themes of our conference: Placemaking and Innovation; Equity, Health and Well-Being; Streets as Places & Transportation; and Place-Led Development & City Making. We could not be more excited, or confident, about the range of inspiring projects and people in this city that we will be showcasing in October! To give you a taste of what is in store for the conference, here are some highlights of our trip. 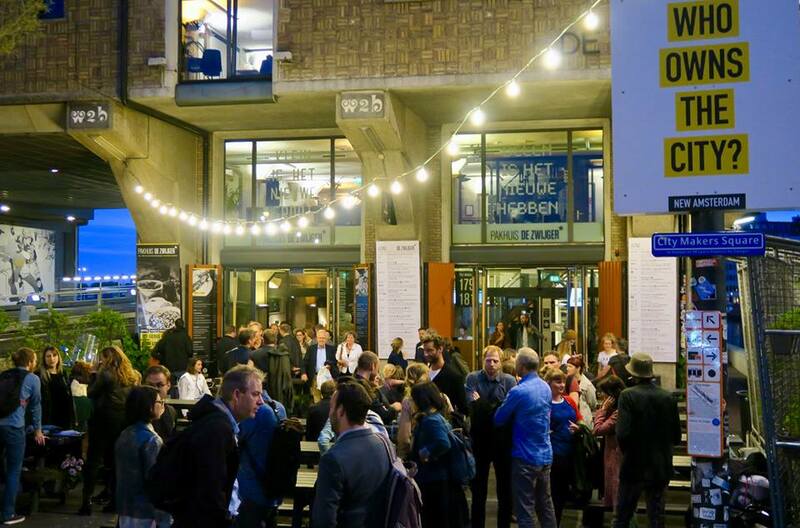 ‍Following the local meet-up, placemakers mingle in front of the headquarters for Placemaking Week 2017—Pakhuis de Zwijger. Placemaking Week is all about scaling up the impact of placemaking. We know that one-off projects can make an impact, but how can we actually take it to the next level and make sure that the process and its outcomes are useful, sustainable, and importantly, inclusive? Amsterdam offers a range of inspiring examples on how cities can do just this. One exemplary case exists in local superstar placemaker Eva de Klerk’s truly innovative NDSM Wharf, where a former shipyard has transformed into a cultural hub in Amsterdam Noord (north). Not only does NDSM host events such as festivals and exhibitions, but it is also a working community of artists and craftspeople, and the location itself is completely accessible by free public transport ferries from the city center. There is great potential for existing places like NDSM to help shape and define the goals for communities that are already in place. Other similar sites were visited on our pre-conference visit, and will most certainly be featured in the program in presentations, or as tours or events. Another site we visited, which will also be featured at Placemaking Week, is a shared space located directly behind Amsterdam’s Centraal Station. 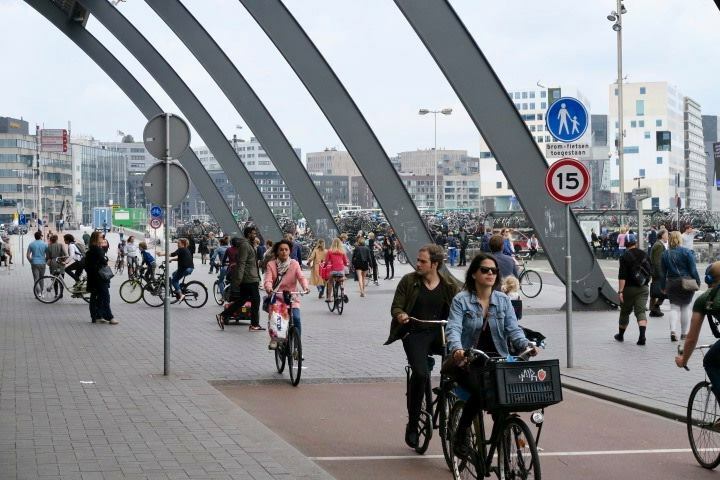 Originally, a major bike lane went directly through the space between the rear entrance of Centraal station on the riverside and the loading space for ferries which take people to Amsterdam Noord (north). You can see the image below of the bike lane, although this is from our recent trip and shows the space after the implementation. ‍Shared space behind Amsterdam's Centraal Station. The space was considered a chaotic one given that there were a range of restrictive signs, and cyclists had the right of way in a place where pedestrians also had to navigate their way through to reach the ferry. As our Placemaking Week partner The City at Eye Level explains, the outcome of the change was notable, “What happens if you take away all the signs at the busiest spot for bikes and pedestrians in Amsterdam? Before, everyone thought it would be disaster. Since the city introduced the 'shared space', there have been zero accidents. People slow down, look each other in the eyes, and negotiate their way.” Well, we experienced the space ourselves, and we must say, it was fascinating to see how well the “figure it out” tactic worked in the flesh! Pieter de Haan who worked on changing the space will luckily be joining us at Placemaking Week and will discuss the thinking behind this change, as well as the results. And, for a virtual experience of the space behind Centraal Station, make sure to view the video from City at Eye Level below! Though this is a global conference, we do want to practice what we preach and learn from the local community—in this case Amsterdammers! In the middle of our visit, we were fortunate to attend a local placemakers meet-up, held in Placemaking Week’s headquarters and main venue, Pakhuis de Zwijger. 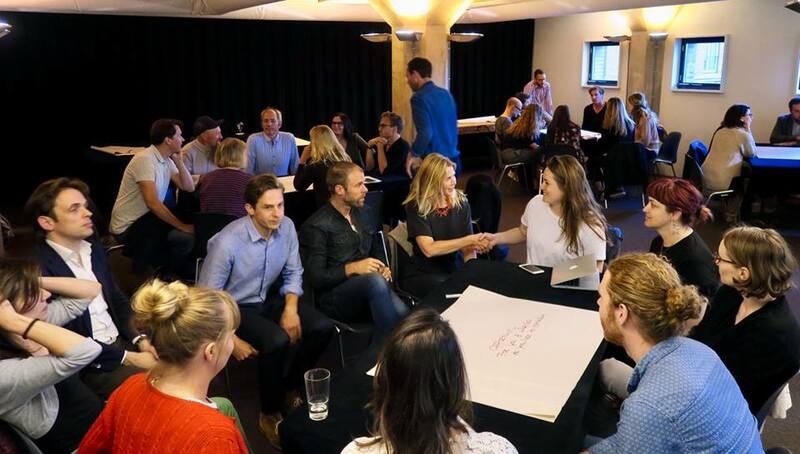 The event drew a cohort of nearly 50 local placemakers who all gathered together in a workshop to discuss goals and ideas for the conference that Amsterdammers feel are important to highlight about their city. What were the results? Hans Karssenberg, partner at Stipo and joint Placemaking Week organizer, noted that there are several typologies of open spaces that are key to placemaking and have the potential to improve the urban dynamics: great streets, places where people intuitively want to stay longer, spaces with a local ownership and a human scale connection with the built environment. We also discussed the ways in which placemaking is a complex social system that needs to be adapted based on the sensitivities of local contexts. If we talk about placemaking, we have to talk about everything we see—from the actual street to the corner shop, from the surrounding buildings to the old man feeding the birds. ‍Engaging discussions during the local placemakers meet-up. For our host region, Europe, this is really about moving from design-led thinking and implementation to place-led thinking and implementation. Importantly, we want to kickstart the European placemaking network and create anchors in each country. But also importantly, we are thinking globally, and moving towards self-organization of the placemaking movement by connecting with other regions, sharing experiences and knowledge that will help us all understand how the placemaking process can change cities for the better. As we move forward with preparations for Placemaking Week, in the coming weeks we will be announcing speakers and events, and hope you will join us for what will surely be an educational and inspiring week!